The hexagonal lattice below maps out the twenty-four movements that make up Variable 4. Each hexagonal tile represents a movement, corresponding to a set of weather conditions: temperature, humidity, wind speed, solar radiation and rainfall. 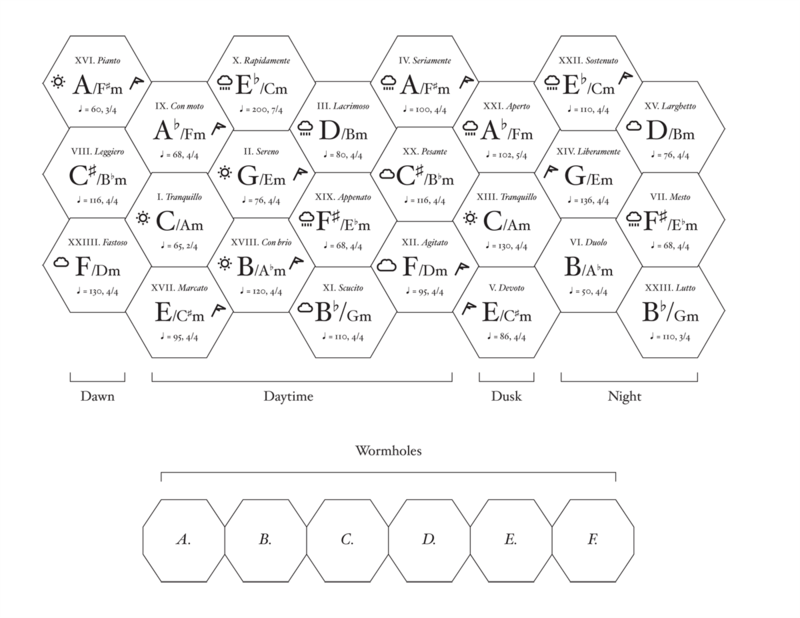 As the piece plays, its position can always be located on this map, constantly shifting and recombining movements according to the changing atmosphere. Each movement also has a tonal centre, tempo and metre, determined by its related weather state. These are spatially linked according to the circle of fifths (and circle of fourths), a musical form common within Western music, making it possible to move between movements whilst maintaining a tonal relationship. Try moving diagonally north-east from any movement, wrapping from top to bottom, and you will see that you continue to move upwards in interval by one fifth per tile. If the weather changes so quickly that the location is caused to jump between distant movements, the piece enters what we term a 'wormhole': an arrhythmical and often atonal bridge, which serves to join two unrelated tonal elements.